Let me tell you about my best espresso machine -La Pavoni this is what I got myself for my birthday and I must say that this is one of the best gifts that I have bought. 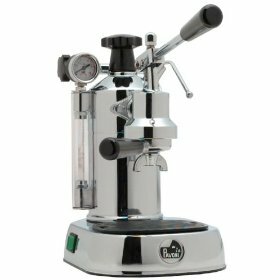 I am so excited about this new coffee machine and compared to other machines, this is a more expensive one and many people cannot handle a Pavoni as they think that this is a very hard to use machine. In my case it also took me a lot of practice to get used to the machine as some of the practice espressos that I have made are really not drinkable and resulted in a thick and bitter espresso. What I like about this machine is that you have the control over the level of espresso you like and I like mine thick but the level of bitterness should not go overboard. This is really my aim that is why I bought this lever machine and I am perfectly happy with it. Some of my friends told me to just buy a new machine that is an automatic one, but I think this is much better.